Congratulations! 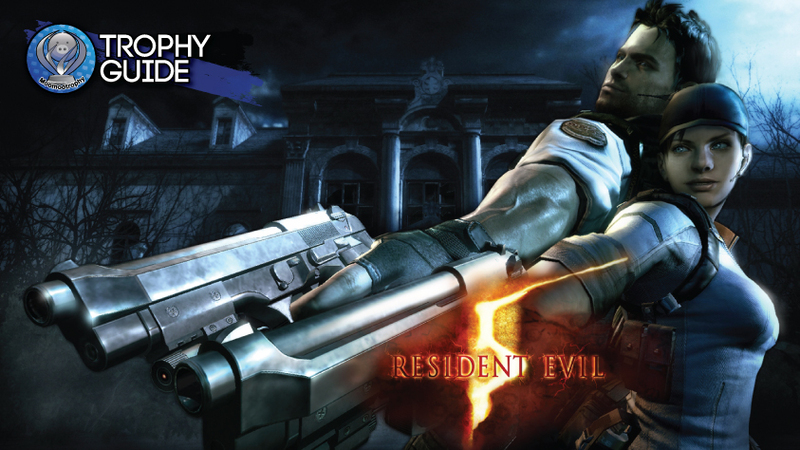 You’ve overcome all your fears in RESIDENT EVIL 5! Complete Chapter 1 – 1 on any difficulty setting. Complete Chapter 1 – 2 on any difficulty setting. Complete Chapter 2 – 1 on any difficulty setting. Complete Chapter 2 – 2 on any difficulty setting. Complete Chapter 2 – 3 on any difficulty setting. Complete Chapter 3 – 1 on any difficulty setting. Complete Chapter 3 – 2 on any difficulty setting. Complete Chapter 3 – 3 on any difficulty setting. Complete Chapter 4 – 1 on any difficulty setting. Complete Chapter 4 – 2 on any difficulty setting. Complete Chapter 5 – 1 on any difficulty setting. Complete Chapter 5 – 2 on any difficulty setting. Complete Chapter 5 – 3 on any difficulty setting. Complete Chapter 6 – 1 on any difficulty setting. Complete Chapter 6 – 2 on any difficulty setting. Complete Chapter 6 – 3 on any difficulty setting. Complete all chapters on Amateur. Complete all chapters on Normal. Complete all chapters on Veteran. Complete all chapters on Professional. Find all 4 types of eggs. Purchase all available alternative costumes in Bonus Features. Obtain all treasures in the game. Find all the BSAA emblems. Save partner 10 times when HELP is displayed. Save partner 10 times when DYING is displayed. Defeat 5 enemies with the Knife. Defeat 30 enemies with the Stun rod. Defeat 30 enemies with the Gatling gun. Defeat 30 enemies with the Longbow. Defeat 20 enemies with physical attacks. Chain the maximum number of combos together in one go. Defeat a Majini with a headshot while it’s jumping. Shoot an enemy Molotov cocktail, dynamite stick, or hand grenade. Deflect a bow gun arrow with your knife. Defeat 3 Majini with one grenade or proximity bomb. Defeat 2 enemies with one flash grenade. Defeat a Majini using the electric current from a transformer. Defeat 3 Majini at once by setting oil canisters on fire. Defeat 3 Majini at once with a drum or gas tank explosion. Work together to save someone special. During the first fight with Wesker, damage him a set number of times. Stop an armored truck by taking out the driver. Defeat a Majini with a rotten egg. Defeat a certain enemy by stabbing it in the heart. Build up a certain level of trust with your partner. Win 15 matches in Slayers. Win 15 matches in Survivors. Win 15 matches in Team Slayers. Win 15 matches in Team Survivors.